It took place during the weekend of September 15th. The weather was perfect, sunny and not too hot. A lot of young couples with kids but not too many shoppers due in part because there was another large art show in town during the same weekend. 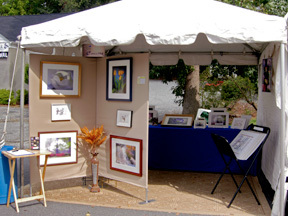 Our booth got a lot of compliments and we sold several prints and greetings cards. Sunday was also our wedding anniversary and my husband got me a beautiful iron sculpture with two gigantic blue butterflies which looked very much at home that same afternoon in our backyard garden. This was the first time that people outside our circle of family and friends saw our PixelGraphs photomontages and it was a very good first experience to talk to people about what PixelGraphs prints are and how they are made.